This Mothers Day, you can send a floral gift that makes a statement. We've found a stunning collection of eye-catching flowers and arranged them all in one towering masterpiece. 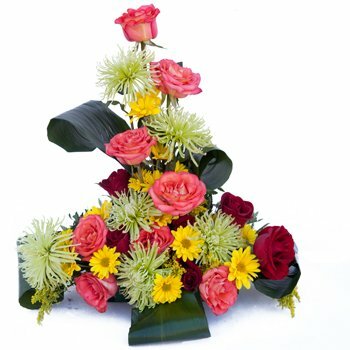 Your loved one will delight in a growing pillar of bright yellow daisies, soft pink and passionate red roses in the height of bloom, and gorgeous white snowballs complemented with a tropical green backdrop. Your Mom's heart will melt when you send the Springtime Salutations Centerpiece.